As days become shorter and temperatures cool, I’m settling into warm and cozy vibes in both my clothing and home decor. 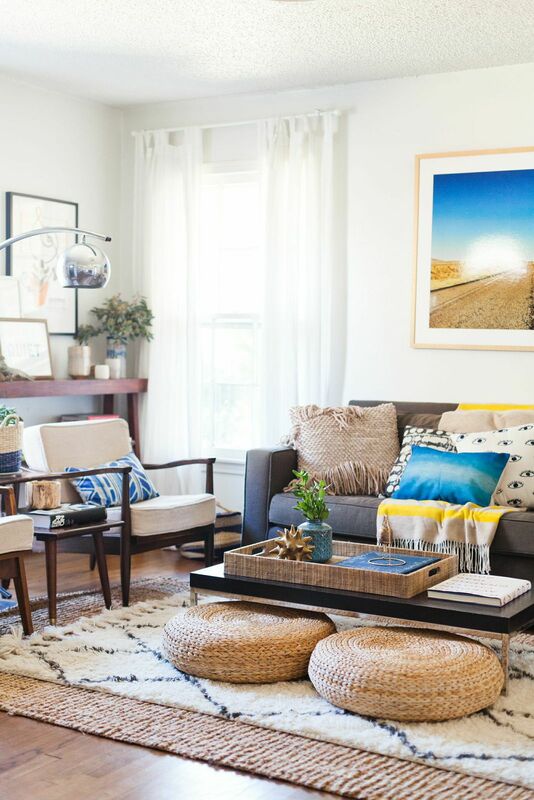 While I hate to see summer go, I absolutely love this time of year, I love everything about layering, staying in and pumpkin spice 😉 So pour yourself a cup of something warm, cuddle up with a throw and enjoy this round up of fall decor I’m loving. 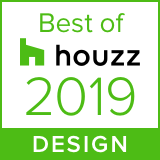 I see it with my clients all the time, we change up one area or aspect of their space which then inspires a whole cascade of design and decor changes; I’m not going to lie – I love it! I love it that is, when it’s my client’s space, when the same thing starts to happen in my own space during the busiest time of year, I start to wish I hadn’t begun! Since this is a more substantial update than the painting, I’ve allowed myself to take my time with it. 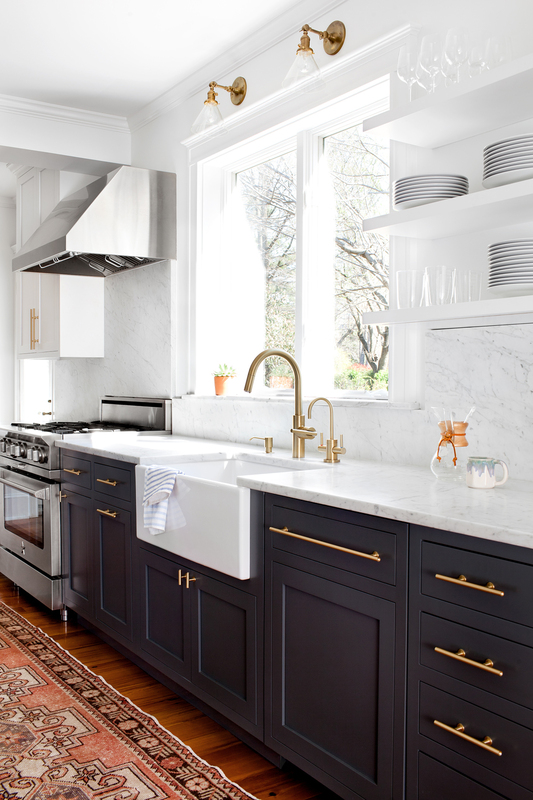 But that hasn’t dampened my incessant collection of kitchen design inspirations. So I thought I would share them here, in case anyone else is looking to update or renovate their kitchen. With Canadian Thanksgiving just days away, I’m in a panic to finally decide on a dinning table. Since having my place painted (embarrassingly nearly four months ago!) I’ve been struggling to make a decision. So it’s been months of eating on the floor or my one chair in the living room (still waiting for my custom sofa to arrive). If you read my post on The Joy of Less, you know that I’ve been relishing all this room to create, which may have perpetuated my indecision. But enough, is enough, time to make a decision. There is no question brass is having a moment. If you had asked me a few years ago if I would ever consider adding brass to a space I was designing, I would have a balked. Today, it’s hard not to add a brass element to every space I’m working on. My favorite of the brass revival is brass lighting. I just can’t get enough, from my own space to those of my clients, I’m dying to use it. Lighting after all is one of the most important elements of a space – it can alter the entire mood and feel of a room. 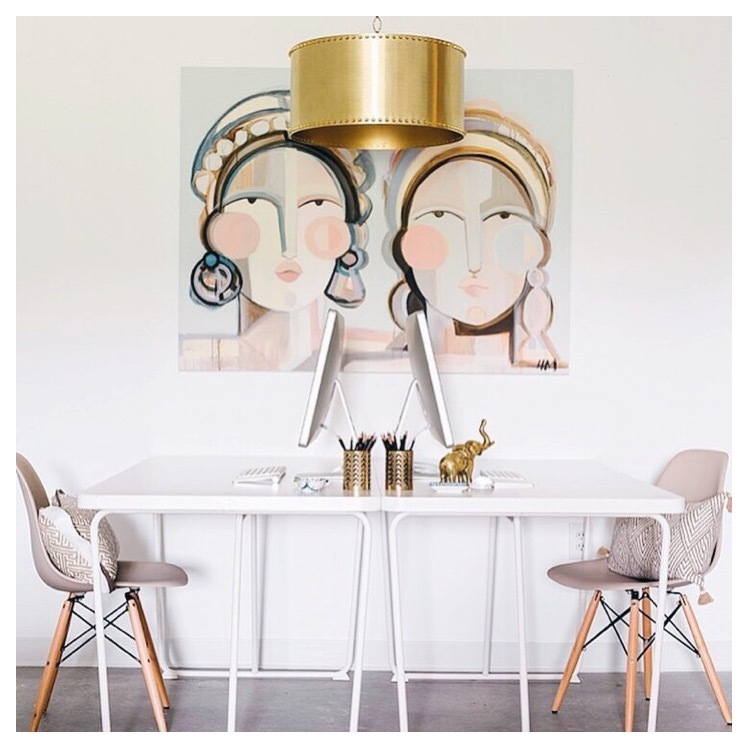 So to make adding some brass lighting to your space easy, I’ve pulled together some of my absolute favorites below. I believe the old adage: you only get one first impression to be true – both in life and in the home. From the moment someone walks into your space, an impression is set. Which is why the entry way is the perfect place to set the tone for your home. 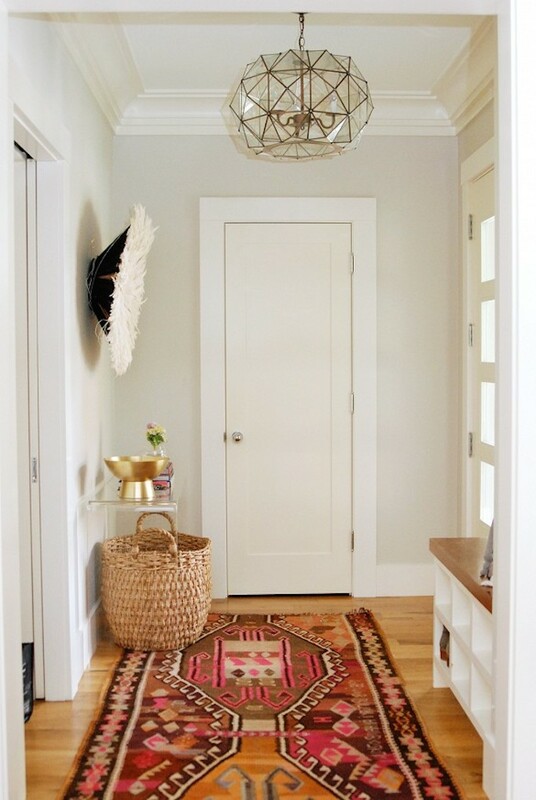 I absolutely love this entry way designed by Becky Owens. Smart, functional and high on style. 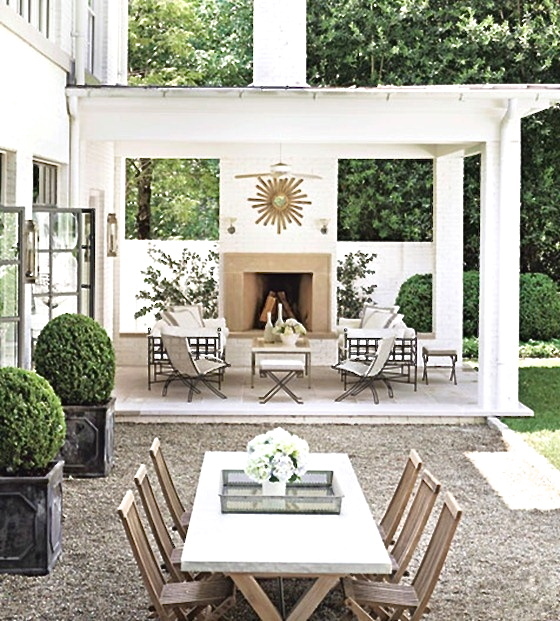 When designing your entry way, start by determining what needs must be met. Storage for scarfs, toques umbrellas, etc? Somewhere to toss your keys or the mail? Something to perch on while putting on shoes? Once you’ve determined what you need in the space, the fun begins! As my clients will tell you – I love wallpaper. I simply cannot get enough and use it in nearly every project I work on. The reason is simple – there are SO many amazing papers out nowadays, we’ve come lights years from the papers of the 70s. Without investing a lot, you’re able to add interest, texture and colour to a space, which allows money to be invested in classic and timeless furniture pieces. With advancements in designs and textures has come improved application – easing the fear of commitment and allowing you to go bold! 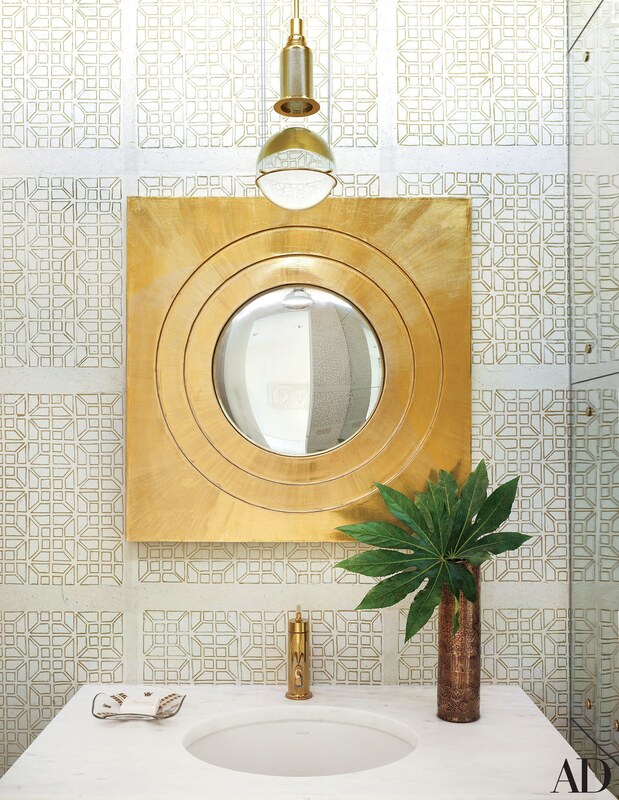 One of my favorite spaces to experiment and have fun in is the powder room. As the saying goes: good things come in small packages, so why not use the paired down proportions of a powder room to express your bold side? I’ve pulled some of my favorite looks for a powder room below. Which is your favorite? 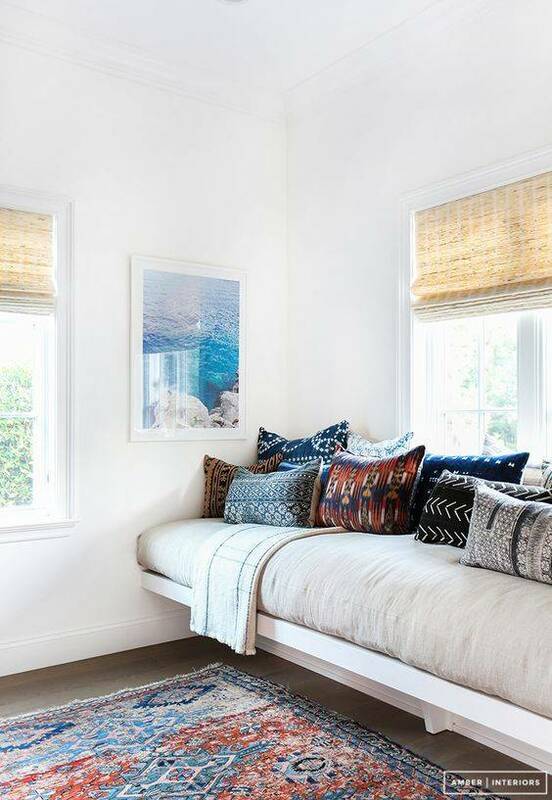 If you saw this weeks Inspired Interiors post, you know I’ve got beach vibes on the brain. 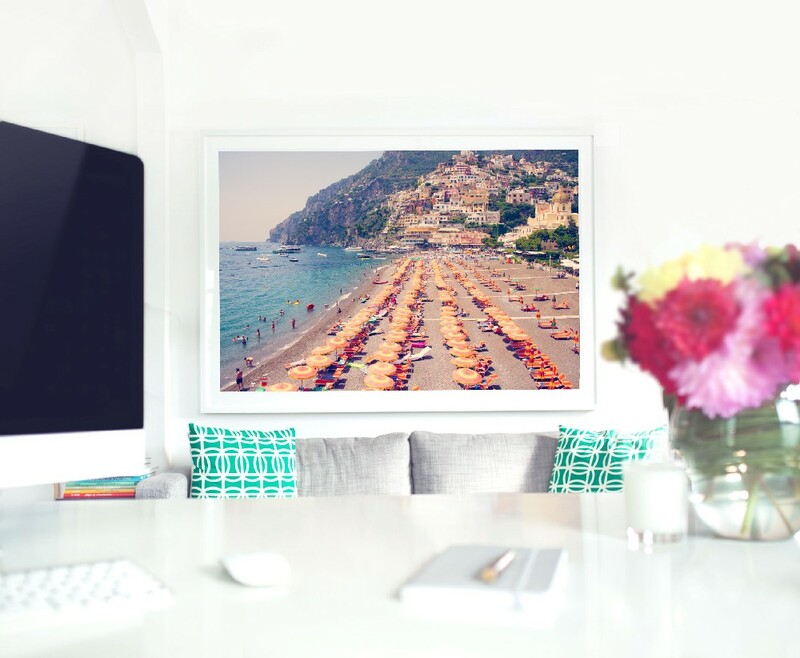 You also know that I won’t be heading to the beach until August, so in addition to lusting over enviable beach houses, I’m obsessed with beach inspired art. Warmer temps, longer days, lighter layers, can only mean one thing – summer is here! Is there anything better than the lazy days of summer, enjoying meals outdoors and if you’re lucky enough to be around water, spending the day in your swimsuit? To make the most of what is sadly a very short season around these parts, I’ve pulled together some summer decor finds I’m loving. 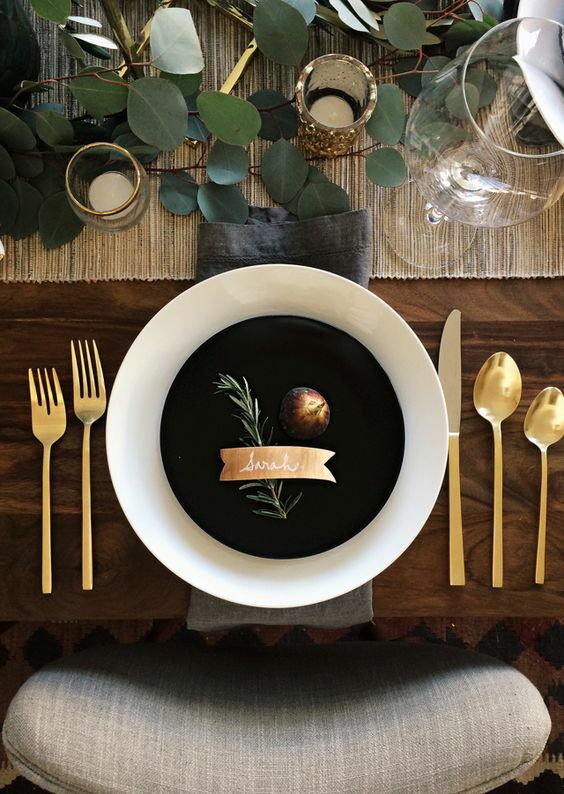 From botanical inspired dinnerware to leaf print throws, you’ll be well on your way to celebrating the season in style. Hello dear friends! I’m back! After nearly three weeks away from blogging due to total chaos in my condo as I had it painted and then … a series of frustrating technically issues … I’m back in front of my computer writing and it feels so right and good!! Can you sense my excitement? Adding to my joy of having my space back to normal so I can write (well sort of, more on that in another post) is what I’m sharing today: My Daybed Love. I simply cannot get enough! An early spring here in the prairies means we’re all ecstatic and spending as much time outside as possible! Many of us save getting our backyards, patios and gardens ready for summer until the May long weekend, but this year that will put us behind! So I’ve pulled together some of my favorite ways to get the backyard ready for quiet mornings enjoying coffee and the paper to entertaining friends and family. 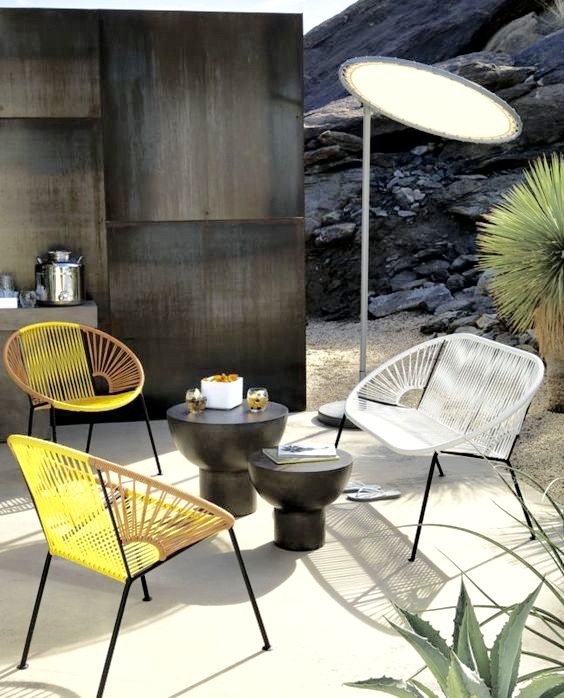 If you’d like a little help organizing your space and pulling it together, take advantage of my Patio Bliss Package.